Where do I begin? In the past I've been pretty pleased with Perpetual Play's Nerf products. Even if there are a few things here or there I'd change, I generally give them a bit of leeway considering this is their first run at things. I don't know what they have on hand to work with or what their entire agreement with Hasbro entails. It's usually not perfect, but I figure they'll get better as time goes on. I won't say I wasn't interested in this particular product. 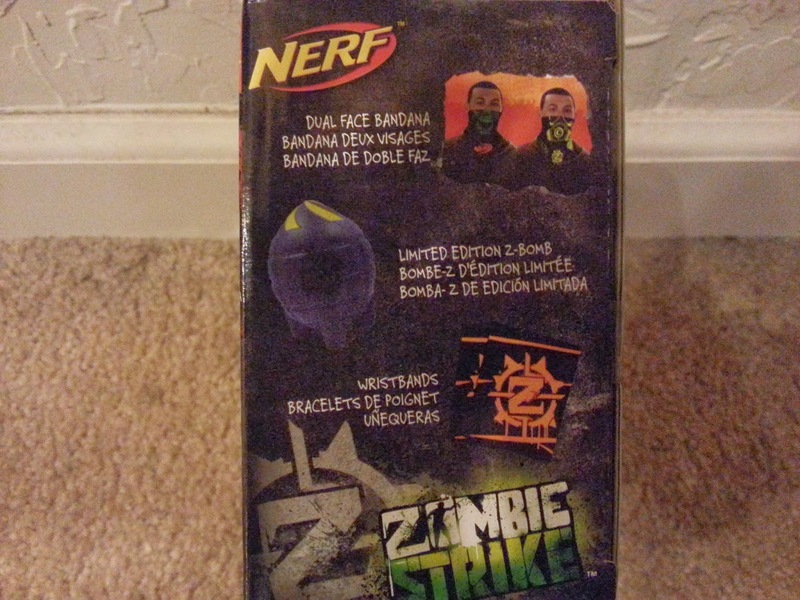 The idea that there was going to be a official Nerf branded bandanna, presumably for use in HvZ events, sounded fantastic. It really showed they were embracing the sport. Needless to say I was pretty disappointed. 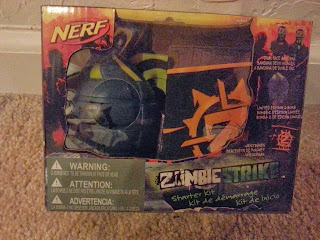 The front of the package, feel that squishy Z-bomb! First, allow me to present you with a bit of background info. I heard Zombiestrike bandanna and immediately images of bandannas that could be worn around your arm and forehead came to mind. 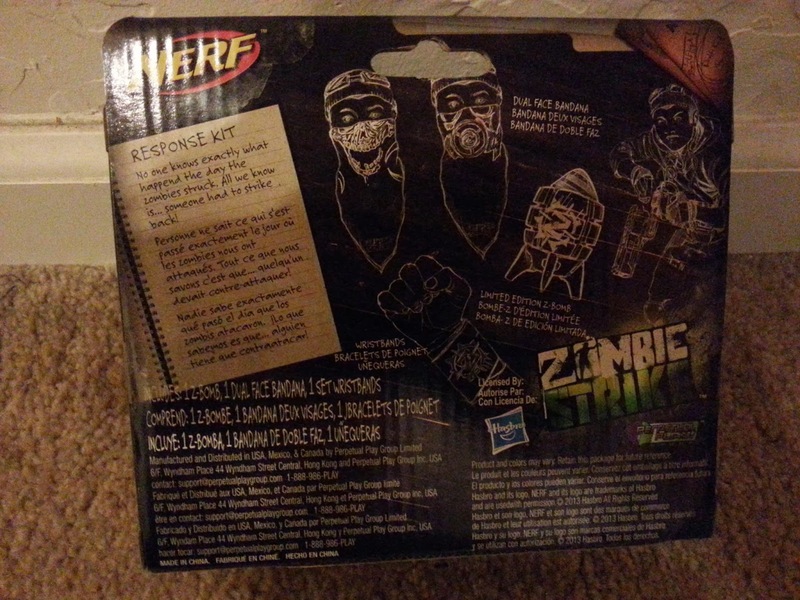 I thought of similar bandannas I'd seen with "human" on one side and "zombie" on the other. When I saw a few images I really hoped that what I was seeing was merely one side of the bandanna, while the other might be more useful to HvZ players. I also figure that if they were charging $9.99 for Z-bombs, that a bandanna couldn't really be more than $4.99. The back of the package, or how 2 be gangsta. When I finally saw it on shelves I was already disappointed. 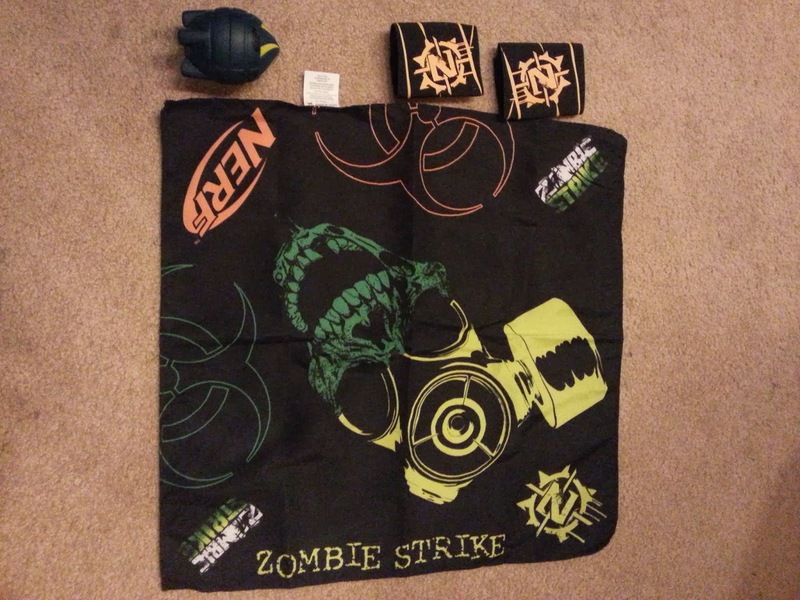 Instead of it being just a bandanna, it included a "limited edition" Z-bomb and some wristbands. "Ok" I told myself "Maybe the wrist bands will be useful, and can hold darts or will work as an armband or something." Then I saw the price, $14.99?! Man, this thing better be awesome! I'd have rather picked up two Z-bombs for $5 cheaper! Plus the Z-bomb I was getting was in my opinion, the worst. It was just the green football/missile thing but in blue! The side, both are the same. Ok, fast forward to home and the products themselves. Z-bomb: Well, you've seen these, you can decide for yourself if you like 'em or not but I'd sure have wished they didn't include it and the price point could have been brought down. 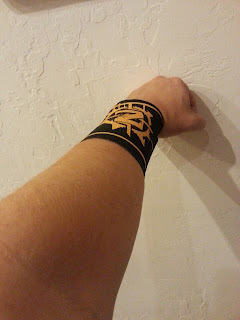 Next, the Wristguards: These things are tiny! I'm a pretty small guy (5'2") and I know that the target market is a younger audience. Still, these things were pretty useless. They are tight on me, and serve no practical purpose. If they held darts, that'd be cool. If they were different colors (one for human, the other for zombie) I could understand their inclusion a bit more. These things serve no real purpose. 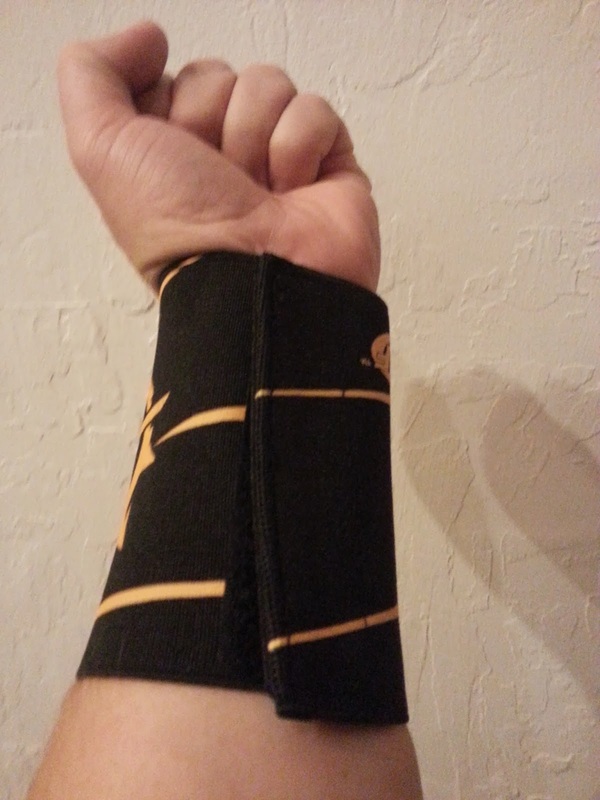 They are somewhat elastic, but the Velcro strip is pretty small, so there's not a lot of room for adjustment. I think some bigger kids will even have a problem with these. I'm punching the wall, because I'm ANGRY! Finally, the Bandanna: This was the main draw here for me, what I had been waiting for! It was....terrible. I guess I shouldn't have been so disappointed, but somehow I was. The bandanna was one sided, full polyester, around 20"X20". I could get it around my face in the intended way, but it was...awkward. I understand that they were going for a zombie/human mask, but it really felt like something nobody would wear. It's supposed to cover from your nose down like an old western bank robber type mask. It doesn't feel great as the full polyester construction is kinda scratchy, and it doesn't look amazing by any means. Also, I wear glasses, and breathing in a mask like this only made them fog up with every breath. Certainly not the type of thing you would want when you were actually exerting yourself, and running around with eye protection on. It looks a like a skull with a gas mask hat. Honestly, I'd stay away from this product. 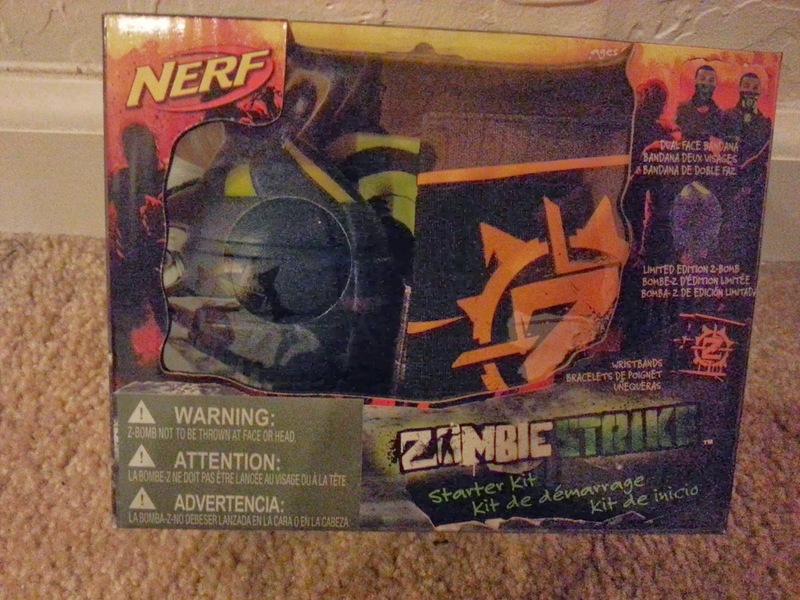 I can't find any practical use for it even outside of HvZ, and the price is just way too high. 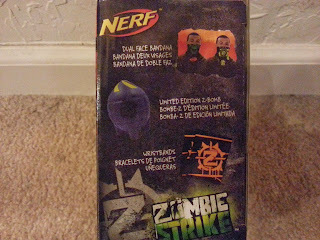 For the price I'd rather get a Zombiestrike machete, or pretty much anything else available. Do your wallet a favor and skip this one. Maybe you're just too much of a man for the wrist guards? Wrist bands are a bit small. Could be cool for blaster tagging "the one with the z band is my stampede". Other than that.. yeah pretty small.. even for kids! We love the bandana but understand it doesn't really fit into the HvZ ruleset... which was a massive oversight on their design team. All and all pretty cool though.. at least for us. 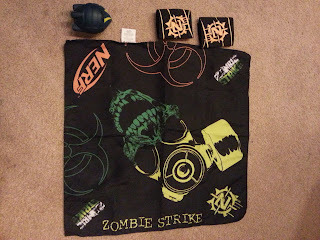 Rarely get any good looking Nerf Swag... what a fabric shield? A shirt maybe? At least this one has a skull on it.